Folks, what's the easiest and most enjoyable kind of practice? Naturally, it's the kind that doesn't seem like practice at all: PLAYING music. So I got a lot of easy practice last weekend. The Old-Time pickers (call them OTP's for short) generally like to play a lot in one key before changing. When we started Friday night, we were in the key of A-- all three of us. In fact, I wondered if I'd come there on the wrong night. But people kept drifting in and in an hour or so, we had ten players-- all pretty good players, too-- three or four each of fiddle and banjo, plus guitar, bass, and two mandolins: a good mix. And what did we play in the key of A? Good stuff-- not only the familiar tunes, but also some oldie goodies like Old Mother Flanagan, Pretty Little Dog, and June Apple. After a couple of hours, we got into the key of D and played some there too-- more good stuff. On Saturday the music was a hair more serious because I was playing a party gig, with a three-piece band including my friends Scott and Cousin David. We played a mix of bluegrass songs and old-time tunes for a delightful outdoor event in Clarke County, Virginia. Scott played guitar and sang, and David switched off from banjo to lead guitar, while I picked a little mandolin. Everybody had a good time. Cousin David is a very versatile musician. Between sets, he was playing some new-age music on his old-age guitar. A mischievous band member said, "Play 'Wipeout'! and he did. Then the same person said, "Now play 'Hey, You, Get Off of My Cloud! '", but David wouldn't play that. Spoilsport. Sunday afternoon's music was back in the traditional groove, playing with the OTP's at a country church in West Virginia. There were eight of us there, again a well-matched ensemble, with three fiddles, three banjos, bass, guitar, and mandolin. We played in the key of D: Cowboy's Dream. Yellow Rose of Texas (not the one you know). Bonaparte Crossing the Rhine. Mississippi Sawyer. Hard Times Come Again No More. More good stuff. When the Sunday music was finished, it was time to go home and collapse for a while. As one of the OTP's said as we packed up, "Now I've got to go to work this week to rest up for the weekend!" But you know what? I was in practice. Posted in By Red, jamming, Practice and tagged banjo, fiddle, mandolin, Mandolin Bridges, red on October 13, 2011 by redhenry. 809 bridges. That's right, 809 of them. That's how many mandolin bridges (mostly maple) I have made since I started making them in the summer of 2002. --as you can see, I tried lots of things. 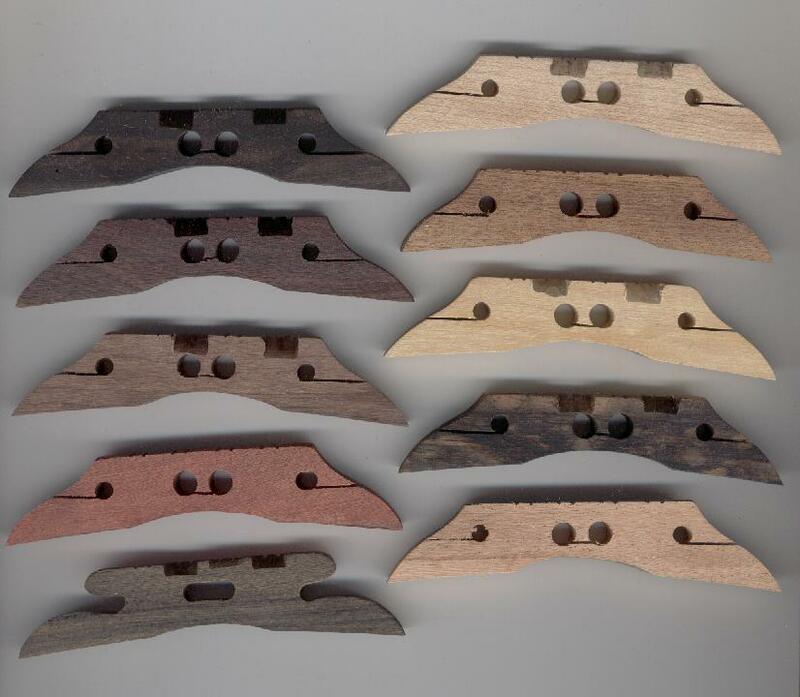 Altogether, I tried about 25 mandolin bridge designs and over 30 different woods. In the end, though, maple proved to be the best-sounding wood, and I settled on just two designs for my production bridges, the 11-hole design and the winged design shown above. All these experiments showed that maple usually provides the best combination of tone, volume and sustain for a mandolin bridge, and I eventually began selling the bridges. Over 750 bridges have been made for sale and shipped them out to customers, and most of those bridges are now installed on someone's mandolin. I have several site-pages devoted to the bridges, including my "hard-sell" page. So, what conclusions can I draw from selling bridges for eight years? 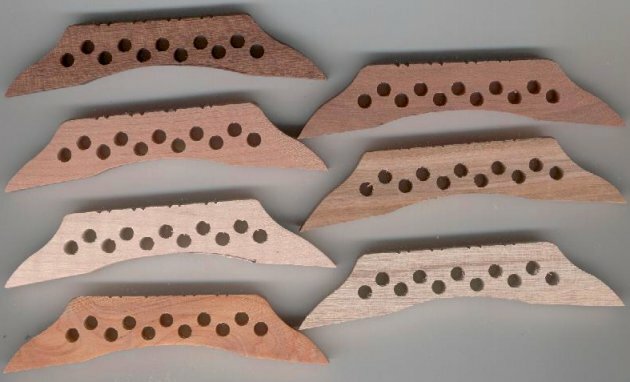 Well, for one thing, making and selling mandolin bridges won't make you rich. But the bridges are certainly worthwhile, when you see the look on a mandolin owner's face when he or she first hears their mandolin with a maple bridge on it! Posted in By Red, Instruments and tagged mandolin, Mandolin Bridges, red on August 10, 2010 by Red Henry. Folks, I just ran across a photo and wanted to share it with you. A few years ago, a member of the "Co-Mando" mandolin email list held a gathering at his house in Maryland, a couple of hours' drive from here. Our friend David McLaughlin rode over to the gathering with me, and we joined nine or ten other mandolin players for an afternoon of visiting and picking. Seen here at the party are 11 mandolins, my mandola, and my home-made mandocello conversion. 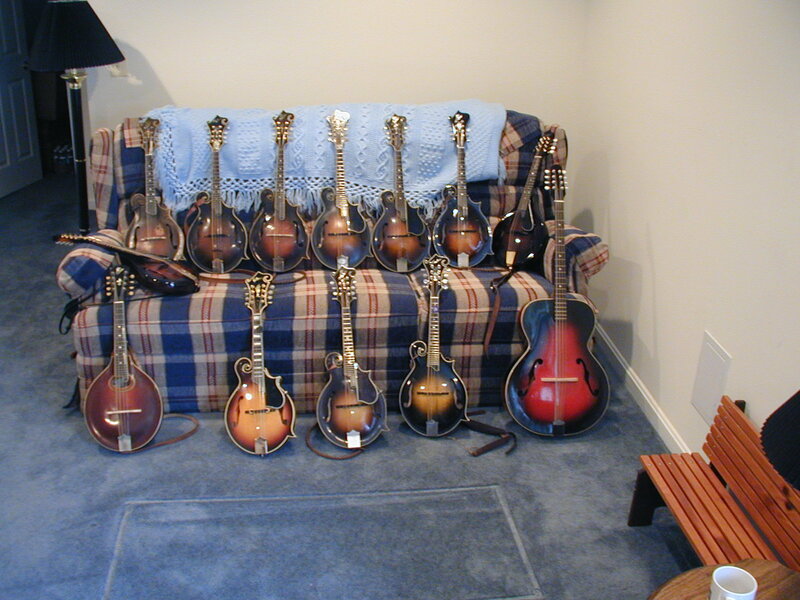 Among the mandolins are the two I brought (Randy Wood #1 and #3), as well as the one David brought (a 1923 F-5). Others seen in the photo include two Rigel mandolins, one late-1950s Gibson, and a few other makes. The other pickers were especially excited to have the chance to play that 1923 F-5, after David generously put it on the couch for "tasting." They were also amused to play Randy Wood #3, the one formerly owned by Bill Monroe, and get themselves a few molecules of Bill as they played. (My four instruments in the picture are distinguished by their light-colored maple bridges.) See if you can pick out David's Loar in the photo! As you can guess, a good time was had by all. And we've got the pictures to prove it! Posted in By Red, Improvising, Instruments, jamming, Mandolin Bridges, pictures and tagged jamming, mandolin, Mandolin Bridges, red on June 29, 2010 by Red Henry. Well, I have made the change. For bluegrass mandolins, I'll be offering this 6-hole winged bridge. For other bridges, to go on oval-hole and round-hole mandolins, my regular 11-hole and 6-hole designs will continue to sound great; the wings don't seem to matter as much on those kinds of mandolins. Interested? If you have any questions, drop me a line at redhenry@visuallink.com . Posted in Accessories, By Red, Instruments, Mandolin Bridges and tagged mandolin, Mandolin Bridges, red on April 13, 2010 by Red Henry. Maple mandolin bridges are still catching on, though slowly. So far I've sold almost 700 of them myself. Over the last 7 or 8 years I've gone through a few different models of the bridges, and I'm considering making another change. But lately I've been thinking about the winged bridges I made at first, which often gave the richest and bassiest tone, deeply desired by many bluegrass mandolin pickers because quite a few bluegrass mandolins don't have much bass. The volume it gave, however, was a few percent less than with other bridge designs. --so if there is some demand for it, I may produce this modified winged design for use on bluegrass mandolins. How about it, bluegrass mandolin players? Is enhancing your mandolin's low end as important for you as it is for others? I may put these bridges into production. Let me know. Posted in Accessories, By Red, Mandolin Bridges and tagged mandolin, Mandolin Bridges, red on March 30, 2010 by Red Henry. Bridge #85. East Indian rosewood, 7.5 g.
Bridge #84. Brazilian rosewood, 8.9 g.
Bridge #67. Bloodwood, 10.4 g.
Bridge #66. African Blackwood, 8.7 g.
Bridge #89. Extra-heavy maple, 7.1 g.
Bridge #90. Teak, 7.6 g.
Bridge #88. Satinwood, 10.1 g.
Bridge #91. Persimmon (American Ebony), 8.7 g.
Bridge #92. Honduras mahogany, 6.4 g.
Posted in By Red, Mandolin Bridges and tagged Mandolin Bridges, red on February 17, 2009 by Red Henry. One of the most enjoyable things about making and trying mandolin bridges has been (sometimes) verifying old assumptions about bridges, but (more often) finding out new things. Last time we talked about bridge weights, and how conventional bridges can bee heavy enough to mute the mandolin. Today, let's talk about another dimension: bridge length. The Gibson company, long ago, made one-piece ebony bridges for their mandolins. These bridges were about 4" long and a little less than 1/4" thick. But then after Gibson introduced adjustable bridges, they began making them 4 1/2" long. If the change was made gradually over several factory-sample bridges, probably no one there noticed a difference in the sound. And bridgemakers ever since have copied that Gibson bridge-length of 4 1/2". Posted in By Red, Mandolin Bridges and tagged Mandolin Bridges, red on September 3, 2008 by Red Henry. If some of you are members of the Mandolin Cafe discussion site, you've seen that mandolin bridges have generated a couple of good discussions lately. One topic has to do with a subject of many experiments I've done, and that is mandolin bridge weight. Most folks may never think much about the bridge that comes on their mandolin---it's only a bridge, right?---but finding the right bridge is possibly the easiest (and sometimes the cheapest) way to give your mandolin a big improvement in sound. One well-proven possibility is to put a maple bridge on your mandolin. Maple bridges are easy to make, and the material is cheap. I also offer bridges that I make (check out my bridge page), but I recommend that you make your own, starting with designs that I've developed and going on to test your own ideas. One of the most remarkable things about maple bridges is that they weigh so much less than conventional, two-piece ebony ones. For example, a maple bridge will typically weigh from 6 to 10 grams installed, and a two-piece ebony bridge might weigh from 13 to 22 grams! ---that's a lot of extra bridge-weight for the mandolin to try to overcome. This "winged" bridge was my standard for a couple of years. These have all weighed about 7g. to 10g. installed (on bluegrass mandolins), and their sound is very rich, clear, and consistent. So that's how I found out the best weight for a mandolin bridge. Don't believe it? Try making one for yourself! Posted in By Red, Mandolin Bridges and tagged Mandolin Bridges, red on August 29, 2008 by Red Henry. When I first began making maple mandolin bridges I got a good bit of flak from folks who were wedded to the conventional bridge stereotype---the idea that because the Gibson company had used ebony for its adjustable bridges (and for the one-piece bridges before that), there was no way to improve on the conventional mandolin bridge. But I believe that the Gibson company, restricted by its requirement for profitability, may never have experimented much with mandolin bridges. It takes some time and imagination to do a lot of bridge experiments, and all that would have gotten in the way of producing mandolins. So now, it's up to us! For centuries, the violin world has known that maple is the best wood for bridges. Now, the Gibson company boasted that they took many of their F-5 mandolin design aspects from fine violins: the arched, finely "graduated" top and back; the f-holes; and the elevated fingerboard and tailpiece, for example. But they seemed to stop when it came to the bridge. So I thought I'd make a one-piece maple bridge for one of my mandolins (Randy Wood #3) and see how it sounded. Here's a photo of Bridge #1. The bridge was really crude, but it sounded great! ...with this bridge, the tone was smoother and the treble was clearer, and the volume took a jump. I could see that I was onto something. So I kept on trying more and more bridge designs until I found my three favorites, the ones I talked about a few days ago. ... you can see that while there were quite a few woods that approached the sound of maple, none of them were better. So that's why I settled on maple as the best wood for mandolin bridges. Since then some mandolin builders I was in touch with, including Peter Coombe, Bill Bussman, and Randy Wood, have started providing one-piece bridges of maple (or ebony, in Peter's case) on the mandolins they make, either as standard equipment or by the customer's request. I do sell maple bridges on our website but I recommend that you make your own. If you play mandolin and you'd like to do some light woodworking, check out the bridgemaking page, where the steps to making a bridge are listed and described. It's fun, and it's by far the cheapest way to upgrade your mandolin's sound! Try out some different designs and let me know how they do. Good luck! Posted in By Red, Mandolin Bridges and tagged Mandolin Bridges, red on August 7, 2008 by Red Henry.